Our winter wedding favors make great favors for your guests at your winter wedding or special event! We carry winter themed favors in favor boxes, tins, bottle stoppers, coasters, ornaments, place card holders, glass votives, flutes, coffee, cappuccino, cocoa and tea! 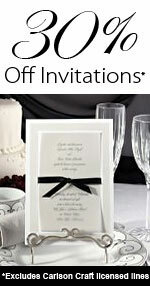 We also carry winter invitations from Carlson Craft, Birchcraft and McPhersons!